When debugging, I log geolocation and the size of the original ics file. To protect the privacy of your data, the converted file has a generic title. You will be prompted to save it on your machine as soon as conversion completes. Data encryption (https) is enabled. I don't keep copies of your ics files. I don't collect or resale your events' information. This is a private hobby and I don't receive any financial benefits. Please select your ics file(s) to be converted in csv. You may select a separator, the desired date format and how time in events should be handled. If you don't need all possible columns from the calendar file, you can omit them. This makes the conversion quicker and the resulting csv file smaller. Comma separated csv files open easily in EXCEL. Tab separated csv files are easier to be viewed in simple text editors. Converted file will be a double quoted in Unicode (UTF-8) text file, ending in '.csv'. Repetition rules BYDAY, BYMONTHDAY are now also supported. Better sorting, even when outputting additional rows due to repetition rules. Now omitting the X-LOTUS-UPDATE-SEQ property which was erroneously outputted sometimes in the 'Location' column. Removed time zone acronyms (such as CDT, CEST, BST, EDT …) from times. Importing into EXCEL should be easier now. Some ongoing conversion issues for UTC times to the calendar's timezone are now solved. Thanks Ron for pointing this out. DTEND PM times on rows created due to repetition riles could sometimes be off. This is now hopefully working better in most of the cases. Repetition rules without INTERVAL would produce identical events with wrong times. Conversion now assumes in such cases that the INTERVAL equals 1. Repetition rule options such as BYDAY, BYMONTHDAY are ignored. This is still work in progress. The CALENDAR column outputs now the CALENDAR name incase it is included in the ics file. If not, the ics file name will be outputted. Sometimes a correct otherwise converted file if inserted into EXCEL, would show NOTES in more than one columns of data. To avoid EXCEL mixing up the separator with colons or quotes contained in the text, I inserted pipe (also known as vertical bar/line) as new type of separator. 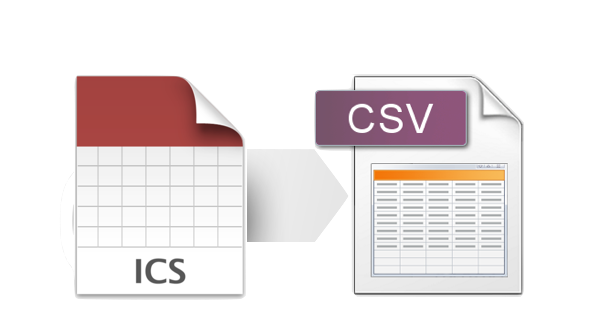 Select the "|" separator before converting and when importing the csv into EXCEL. Sometimes the URL was outputted in more than one rows of data. This is now hopefully working better in most of the cases. Data encryption (https) is now enabled. Better handling of events with alert settings. Sometimes the ATTENDEES would get outputted in more than one rows of data. This is now hopefully working better in most of the cases. Sometimes the text in the NOTES would get outputted in more than one rows of data. This is now hopefully working better in most of the cases. Events without a SUMMARY value would result in wrong event dates to following events. Those events are now listed as untitled and their dates or those of following events are now correct. You can now omit some columns' conversion if you don't need them in the csv file. Events scheduled on the same date are not anymore ommitted while sorted. Events of calendars with language definition in the SUMMARY are now converted. Now omitting the TRUE X-MS-OLK-FORCEINSPECTOROPEN property which was erroneously outputted sometimes in the 'Location' column. Events are now sorted by 'Start' date (DTSTART). HTML in 'Description' defined by X-ALT-DESC;FMTTYPE=text/html: was not stripped. Now only the plain text in 'Description' gets converted. PM or AM for 12-hour clock times is now perserved when splitting date and time. Better 'Description' handling for formatted QUOTED-PRINTABLE cases. 'Priority' column for reminder events is now also supported.